TAMPA, Fla. -- Police cordoned off a Florida neighborhood and searched intensely for a possible serial killer Tuesday after a fourth person was shot dead. Tampa police say residents of the city's Seminole Heights neighborhood reported hearing shots just before 5 a.m. Tuesday. When officers arrived, they found the body of Ronald Felton, 60, in the street. They say Felton had been walking across the street to meet someone when the gunman came up behind him and fired. 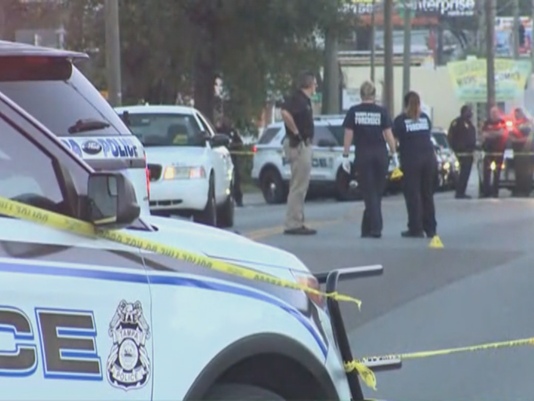 Until evidence says otherwise, Tampa police are relating the shooting death to the three October killings, reports CBS Tampa affiliate WTSP-TV. However, Spokesman Steve Hegarty said detectives can't immediately say whether Felton's shooting is related to last month's 10-day spree where three people were slain, but officers are treating it like it is. The previous three victims were alone and had gotten off a bus when they were gunned downed at night for no apparent reason. None was robbed. "This has got to stop," Mayor Bob Buckhorn told a news conference on Tuesday. "We will hunt this person down until we find him." Cynthia Murray told The Tampa Bay Times that Felton had been living with her near the shooting scene. She said Felton was an unemployed construction worker who volunteered at the nearby food bank run by a church, which is just feet from where he was shot. She said he would go to the church at 2:30 a.m. to help. "He didn't need to come here every week but he loved it," she said about Felton's volunteer work. She said Felton and his twin brother Reggie were well known in the area. "He was the sweetest person, never any problems," his cousin, Linda Daniels, told the paper. Hegarty said the suspect couldn't have "gone very far, and we're talking to as many people as we can to see what they may have seen." Several schools were under "lock in," meaning children can be dropped off but will stay there safe until further notice, WTSP reports. Robert Clark told the Times he was in a nearby Laundromat with his girlfriend when he heard five shots, turned and saw a man run past. He said he went outside and saw Felton's body. After the earlier shootings, police increased patrols in the neighborhood and released surveillance videos of a hooded suspect. In a security video taken moments after 22-year-old Benjamin Mitchell became the first victim on Oct. 9, the suspect is running from the scene. "I've come up with four reasons why this person is running," Police Chief Brian Dugan said last month. "One, they may be late for dinner. Two, they're out exercising. Three, they heard gunshots. And number four, they just murdered Benjamin Mitchell." Two days after Mitchell was shot, Monica Hoffa, 32, was gunned down. And on Oct. 19, Anthony Naiboa, 20, was shot after taking the wrong bus home from his new job. Police patrolling nearby heard the gunshots and rushed to the scene to find Naiboa dead. Casimar Naiboa, Anthony Naiboa's father, said Felton's slaying "is like salt in the wound"
"It brings back dark memories," said Naiboa, 50. "I still dream about my son." Police have told him they hope the killer makes a mistake. "But every time he makes a mistake, someone loses their life," Naiboa said. Seminole Heights is a working-class neighborhood northeast of downtown Tampa that's slowly becoming gentrified. Run-down homes sit next to renovated, historic bungalows, and trendy restaurants have sprung up near auto body shops.